Think about Hansel and Gretel going into the woods. What did they leave behind? They left breadcrumbs to find their way out of the forest. What if you were taking their journey? What would you leave to mark your way? Where in the world are you? Where have you come from? Where are you going? How will you find your way? Wayfinding is a term that encompasses all of the clues that humans (and animals and insects) use, create and look for to orient themselves and to navigate environments. Wayfinding can refer to landmarks, edges, fields or nodes in a city or signage and directional graphics on the inside of a building. 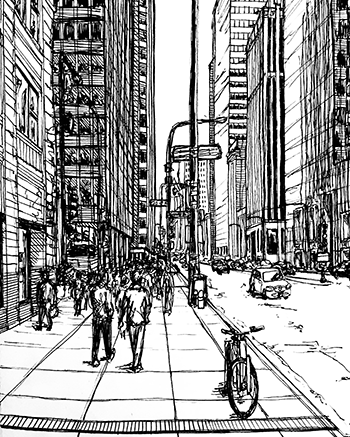 The term wayfinding was coined by the writings of an urban designer, Kevin Lynch, in his book, The Image of the City. He created maps of neighborhoods based on interviews, observations, and measurements. He introduced ways of annotating (using symbols, titles, color, logos) maps that called out visual landmarks, structural edges and key intersections that were memorable such as highways, rivers, parks, and buildings. Wayfinding auditorially, texturally or visually marks critical moments in space that assist people attempting to find their way around. Wayfinding not only helps us understand a path through a place or series of situations, but it also assists us in understanding how a site place is organized. Wayfinding connects with all of the senses- sight, sound, touch, smell, and feeling. How will get you from here to there? Where are you? How do you know where you are? What clues can you see from right where you are that inform your position in space? Is it a door? Is it a sign? Is it a path on the ground? Is it the sun in the sky or the way the wind is blowing? Is it a sound or series of sound like waves, birds chirping, traffic or children playing? What cues do you seek to place your location? 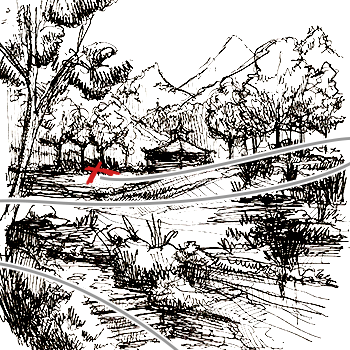 What signals inform your understanding of where you are in a place? This understanding is known as spatial sensing and environmental awareness. Human beings, like animals, rely heavily on their sensory input to navigate the world. Also, people create ways of marking their environments, naming them, and directing others in, through and around. Take a look at the Place Exploration, Place Experience, Placemaking for ideas about reading spaces and identifying key characteristics. Then check out Diagramming, [Symbols]( and Mapping, and Signs journeys. Begin a wayfinding catalog of what can be used to communicate location, navigation, and destination. Post your notes, sketches, diagrams, and symbols in your journal. Prepare to begin a wayfinding adventure! Imagine you have hidden a treasure somewhere. Now you want to make a map to remember where you have buried your treasure. How will you retrace your steps? How will you identify where to turn, right or left, north or south? What markings can you choose to record to lead the way? What symbols can you use to mark the critical steps of the path from any point to the treasure? Take a look at treasure maps and see what has been used in the past. Which symbols do you think work well? How can you create graphics that make sense, build confidence and show a clear path with clear signs? Which directions are clear? In making your map include a map key and if appropriate a scale. Mark your treasure! Every school is a unique place full of various spaces in which to learn and do many activities. Schools are also full of interesting people. Using the Brainstorming Journey, think about what is unique about your school. Think about the spaces and people and experiences that stand out and make it exciting and fun to attend. Consider both inside and outside areas. Think about the experience of coming into school, attending school, going to lunch, playing at recess, and heading home at the end of the day. Make rough drafts of navigational flows of students during the day. What do they need to know? What is hard to find? Make a list of people and a list of places and a list of experiences. Create symbols, drawings, and diagrams of these items. Create one wayfinding map or a series of wayfinding maps to identify areas of your school. Work with your teachers and principals to find creative ways to post navigational supports utilizing the floor, walls, and ceiling when possible. 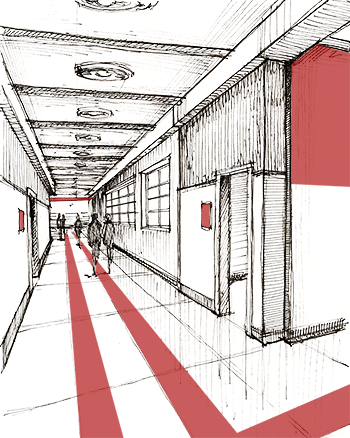 Submit a proposal explaining what wayfinding can do for your school. Share at least three different alternatives to add wayfinding graphics to your school. Get feedback from classmates, teachers and your principal. Prepare and post a final design proforma of your schools’ wayfinding. Now that you are becoming a wayfinding expert take a look at your community. Consider checking out what is on Historypin, too. How does your community present itself? Do neighborhoods have friendly maps? What should your community show to represent what it has to offer? Consider all of the activities that are possible in your community. A good idea is to start making lists in your journal. Make a list of important places. Make a diagram of what is up (north) and what is down (south) and what is to your left and right (east and west). How are people welcomed coming into town? What resources are available to help new neighbors find their way around? What does your community need to embrace new residents? Brainstorm what new people and visitors might need to find their way around your city. Think about different age groups such as babies, young children, teens, college students, dog walkers, nature lovers, book worms, shoppers, runners, bikers, professionals, and grandparents. Add as many user types as you can imagine. Make scenarios of possible new residents or visitors. Create a list of ‘must do’s’ and 'need to know’. Share your list with your parents and friends. Can they add anything else? Being to think about how your ideas need to be visualized. Do they need to be in signage? Do they need to be painted symbols on the sidewalk? 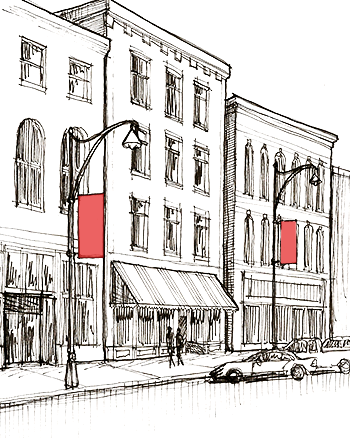 Do you need banners on street lights? Do you need maps to hand out? Do you need a community website? All of these media are part of a wayfinding campaign. 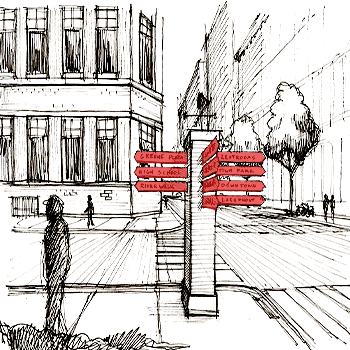 Create at least three different scales of wayfinding interventions for where you live. Digital wayfinding is the use of electronic signage and apps to identify a location and to give directional instructions to assist us navigating large public spaces, and large building complexes. Digital signs are usually posted at main entrances, by stairwells and elevator lobbies. Like the digital wayfinding used on land and in the air by drivers, bicyclists, and pilots, electronic signs can reduce stress, frustration, and feelings of being lost. Digital wayfinding saves time and provides the best route practices. Examples of digital wayfinding include touch screen maps, programmable light boards, embedded linear paths in the floor, on the walls and in the ceilings. Digital wayfinding signs, maps, and tools are essential in large multimodal centers where travelers move between planes, railways, bus, bikes, and taxis. Designers and lighting engineers create a graphics package for signage that accommodates wayfinding while portraying an image and character of a specific place. The larger and busier the complex, the more generic or neutral the letters and signage becomes to be easily seen and comprehended. 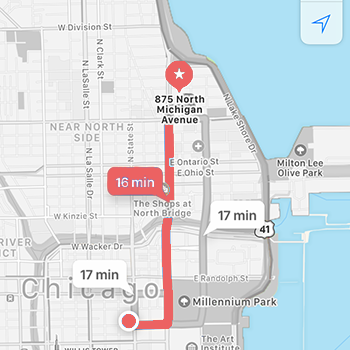 Digital Wayfinding Apps such as Google Maps and WAZE offer handheld and computer screen cues and processes to help people find ways to go from one place to other destinations. You can check your directions before you start your trip or while you are enjoying your trip! Digitally map your next trip! Wayfinding helps us understand how a place is organized.